Offers a king-sized bed with a slate fireplace. The room is tastefully decorated with a nod to Cornell University and the Ornithology Lab as native bird prints adorn the walls. The bath across the hall is the largest in the manor. After a day of wine tasting, you will want to sleep in and chose to join us for Brunch at 10:30 am. Individual Heat & Air in each room. You are in control of your comfort. Parking accommodates large campers and boat trailers. Large parlor with TV, card and board games. In the unlikely occurrence of inclement weather preventing travel, refunds will be determined per the routine cancellation policy. Our on-line reservation tool and website respect your privacy and is committed to protecting it. Your personal information is collected and stored to assist online reservations. Information is never sold or shared. Our on-line reservation tool uses industry standard encryption to protect your personal payment information. We will not use your image without a signed photography consent form. All rates quoted are subject to availability and alteration. Special offers quoted are limited and subject to availability and minimum night stay. 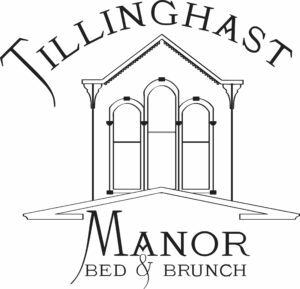 Tillinghast Manor LLC Reserves the right to change information and descriptions of the rooms, tours, amenities and packages. coffee shops in Ovid for which we can make recommendations. When available, coupons will be provided. Brunch includes late check-out and a gift. Tastings – We have tasting coupons from many Cayuga & Seneca Lake Wineries, Breweries, Cideries and Distilleries. See the White Deer – The largest population of the leucistic whitetails are located on the former Seneca Army Depot. These deer are not albinos as they lack a pigmentation in their hair but have normal brown eyes. The tours last 90 minutes and includes the history of the Army base.